Suisse et Nord de l'Italie. 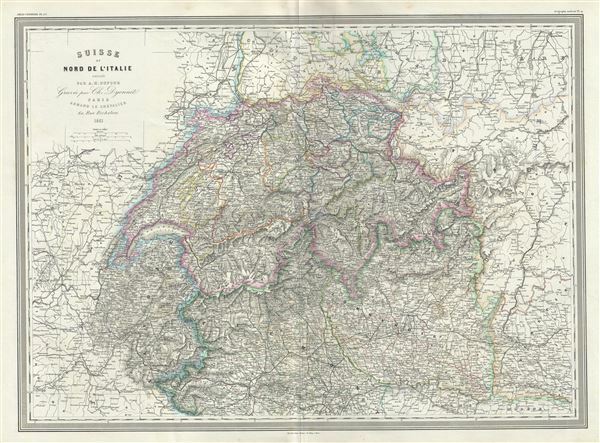 This is an uncommon 1861 elephant folio map of Switzerland and northern Italy by A. H. Dufour. It depicts Switzerland in its entirety as well as the northern part of Italy including the territories of Piedmont and Lombardy. Throughout, the map identifies various cities, towns, rivers and an assortment of additional topographical details. After the creation of a federal constitution in 1848, Switzerland underwent a rapid social and economic development. The cantonal currencies were replaced by a single currency (the Swiss Frank) and many of the cantons subsequently established representative governments and instituted freedom of the press and trade. As this map went to presses Giuseppe Garibaldi and his Red Shirts led the drive for Italian unification. On March 17, 1861, the Sardinian government led by the Count of Cavour finally declared a united Italian Kingdom. Italy would not be fully united until the Franco-Prussia War forced France to abandon its support of the Papal States in 1870. The Province of Venetia would remain under Austrian control until the Austro-Prussian War or the Third Italian War of Independence in 1866, when it would be ceded to the Kingdom of Italy. This map was prepared by Auguste-Henri Dufour and engraved by Charles Dyonette for publication plate no. 23 in Armand Le Chevalier's 1860 edition of Atlas Universel, Physique, Historique et Politique de Geographie Ancienne et Moderne.